The engine management systems on today’s BMW GS motorcycles are smart, efficient and reliable, but there’s little to do when your motorcycle dies except to watch a blinking fault light and wait for roadside assistance. 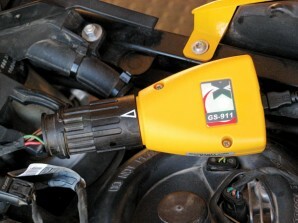 Our GS-911 Professional tool taps into the diagnostic port on most BMWs, exchanging commands and data with software we have loaded onto our computer. Depending on the model and year of your BMW, the unit will read out Engine Control Unit (ECU) data and real-time information, run function tests, read and clear fault codes, and reset service reminders. The Hex Code professional can be used on an unlimited number of bikes. What models are covered in GS-911? Shown here are some of the models covered in either of the full release. § Read Diagnostic Fault Codes - This shows the Fault codes and text descriptions of the faults stored on the Electronic Control Unit. § Shows ECU information - See hardware and software versions, manufacturing dates, and other manufacturer related data. § Clears Diagnostic Fault Codes - Enables you to erase fault codes once the problem has been fixed. § Service Functionality - This differs from model to model and controller to controller, and ranges from Service Reminder resets, output tests adaptation resets etc.